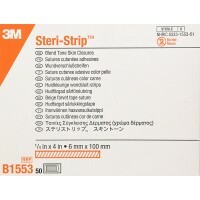 3M Steri-Strip Blend Tone Skin Closures R1547 can be used when there is a need for a non-reinforced, gentle closure. It is barely noticeable and allows natural skin tone to show through, making it ideal for face and hand applications. 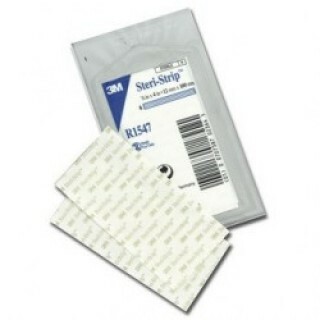 These skin closure strips are made with a porous, non-woven backing reinforced with polyester filaments. 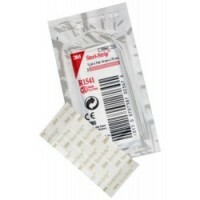 Steri-Strip skin closures can be used in the closure of lacerations, surgical incisions, and following early suture/staple removal. The micro-porous material is strong, breathable, and comfortable to wear. The non-invasive design provides wound support and assists in increasing the tensile strength of the wound. 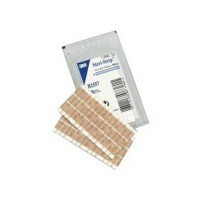 Used properly, these strips also provide a better cosmetic outcome than sutures or staples. Product and packaging are latex free. Size: 1/2 in. 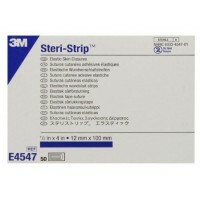 x 4 in./12mm x 100mm.To equip hospitals with tools to implement infection prevention strategies, improve patient outcomes and reduce costs, 3M offers a full line of 3M Steri-Strip Adhesive Skin Closures that have been clinically proven in numerous studies to help stop surgical site infections at the most ideal time: Before They Start. For more than a century, people worldwide have looked to 3M for new products and ideas that solve everyday problems and make their lives easier and better. 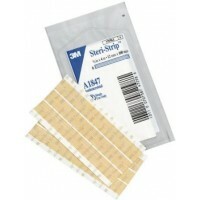 For decades, hospitals, clinics, and laboratories have trusted 3M as a dedicated partner supplying essential products designed to meet the unique needs of health professionals, thereby contributing to the advancement of better health practices, outcomes and quality of care.